New work for Virginia Living Magazine. 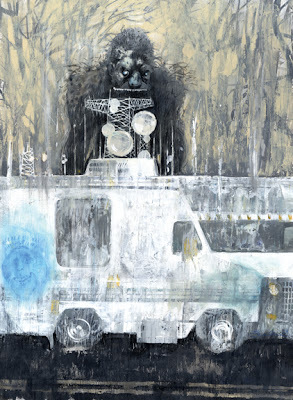 This is yet another character driven piece on Bigfoot in Virginia, and those who obsess over the mythology (yes, they do drive around in a converted veternarian RV). I tried to use perception vs. reality to express the article that I wrote below. Note Harry from Harry and the Hendersons on the side of the RV- which is the perception part of the image. I've included a couple of the original character studies, which I eventually transfered using gloss medium. The legend of Bigfoot is often associated with the Pacific Northwest. Little known, is that there are frequent sightings of the legendary Sasquatch right here in Virginia. Hunters of this kind of lore search with the intent of validating superstition. To bring an element of science to the art of mythology. What happens when they stand face to face; toe to toe with the very legends that they are chasing? Do these obsessions come to an end, or do they deepen with the encounter? What of the legends being pursued? Are they celebrated? Forgotten? Popularized and exploited? When the chased stop running, the pursuers can find that they bit off more than they can chew. A word of warning to all those in pursuit of legends- beware, you might just find what you are looking for.